jade we had as a 9 wk old puppy & Jen was my daughters dog she was a rescue dog who was 4 years of age when my daughter had her they are/were the most loving & gentlest dogs I have ever known. Thanks so much for sharing your story of your wonderful girls and that beautiful picture. That is definitely one of the sweetest German Shepherd pictures I have seen. I am so sorry for the loss of your one big baby. I hope the other remaining GSD is doing okay - some people don't believe it but dogs worry and despair after the loss of a loved one too just like us. Please give her all the attention she needs to get past the loss and work her way through the grief. I honestly agree with you that these big old creatures that so many are afraid of are nothing but big babies in the right situations. The way people raise their dogs is so evident and in the seniors it is so sweet to see how they simply meld into our families. I hope you all are well and getting past the loss of you wonderful Jen. You will not get over her because the memory will always be there but it does get better in time. The grief you feel now will once be replaced with tears of joy. I wish you the best. Two sleeping Beauties, Jen and Jade!!! They look content and have a loving home with people to take care of them. 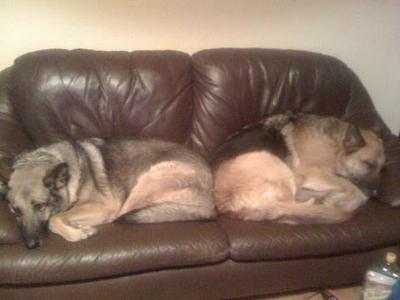 German Shepherds are amazing you have 2. Take care of your girls and you have the double protection!